Fructose and Cardiometabolic Health: What the Evidence From Sugar-Sweetened Beverages Tells Us. Systematic review of the effect of processing of whole-grain oat cereals on glycaemic response. Effects of zinc supplementation on markers of insulin resistance and lipid profiles in women with polycystic ovary syndrome: a randomized, double-blind, placebo-controlled trial. Omega-3 fatty acids for cystic fibrosis. Effect of Nutrients, Dietary Supplements and Vitamins on Cognition: a Systematic Review and Meta-Analysis of Randomized Controlled Trials. Effect of pistachio nut consumption on endothelial function and arterial stiffness. Impact of palm date consumption on microbiota growth and large intestinal health: a randomised, controlled, cross-over, human intervention study. Type and amount of dietary protein in the treatment of metabolic syndrome: a randomized controlled trial. Randomised clinical trial: gut microbiome biomarkers are associated with clinical response to a low FODMAP diet in children with the irritable bowel syndrome. Scientists bust myth that our bodies have more bacteria than human cells: Decades-old assumption about microbiota revisited. Want to rock your wellness blog with consistent, credible content? Want a week (or two) off from creating content this month? Supplements – Certain probiotics can help increase iron absorption. Disease Prevention – Despite being a popular recommendation, eating more frequently throughout the day does NOT reduce energy intake or improve weight status. Anatomy & Physiology – We may actually NOT have 10x more microbiota in our gut than the number of cells in our body! Evidence has demonstrated that in inflammatory bowel diseases (IBD), including Crohn’s disease (CD) and ulcerative colitis (UC), dysfunction of the immune response to gut microbiota occurs in context of host genetic predisposition. CD is a chronic and commonly disabling inflammatory disorder of the intestine, and its prevalence and incidence are increased in developed countries1. Because etiology of this disease remains poorly understood, no specific treatment is available. CD preferentially affects young adults and is a major public health problem because of its chronic and recurrent nature and growing prevalence. Among factors associated with a Western lifestyle, changes in dietary habits should be investigated because escalating consumption of fat and sugar in Western countries parallels increased incidence of CD16,17. Western diet is enriched in total fat, animal proteins, n-6 polyunsaturated fatty acids and refined sugars, and it is considered as a predominant trigger implicated in development of IBD16. Recent advances have shown that the abnormal inflammatory response observed in CD involves an interplay among intestinal microbiota, host genetics and environmental factors. The escalating consumption of fat and sugar in Western countries parallels an increased incidence of CD during the latter 20th century. The impact of a HF/HS diet in mice was evaluated for the gut micro-inflammation, intestinal microbiota composition, function and selection of an E. coli population. The HF/HS diet created a specific inflammatory environment in the gut, correlated with intestinal mucosa dysbiosis characterized by an overgrowth of pro-inflammatory Proteobacteria such as E. coli, a decrease in protective bacteria, and a significantly decreased of SCFA concentrations. Here’s another reason to eat your vegetables. Trillions of microbes in the human large intestine—known as the microbiome—depend on dietary fiber to thrive and give us energy. As fiber intake declines, so, too, does the range of bacteria that can survive in the gut. Now, a new study of multiple generations of mice fed a low-fiber diet indicates that this diversity plummets further with each generation, a hint of what might be happening in the human gut as we continue eating a contemporary diet of refined foods. The work might also help explain rises in many Western diseases, such as inflammatory bowel disease and obesity. In this review we summarize the epidemiological and clinical trial evidence evaluating added sugars, especially sugar-sweetened beverages, and the risk of obesity, diabetes, and cardiovascular disease and address potential biological mechanisms with an emphasis on fructose physiology. 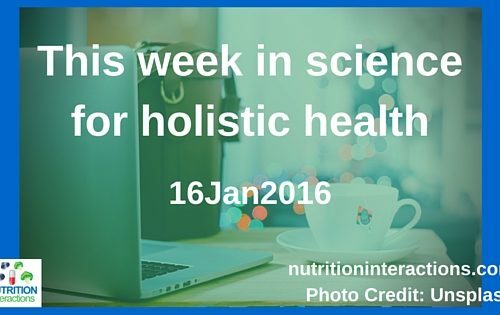 We also discuss strategies to reduce intake of fructose-containing beverages. The more processed the oats, the higher the glycaemic response. Steel-cut oats (GI=55 (se 2·5)), large-flake oats (GI=53 (se 2·0)) and muesli and granola (GI=56 (se 1·7)) elicited low to medium glycaemic response. Quick-cooking oats and instant oatmeal produced significantly higher glycaemic response (GI=71 (se 2·7) and 75 (se 2·8), respectively) than did muesli and granola or large-flake oatmeal porridge. The analysis establishes that differences in processing protocols and cooking practices modify the glycaemic response to foods made with whole-grain oats. Smaller particle size and increased starch gelatinisation appear to increase the glycaemic response. Folic acid supplementation was not associated with risk of major childhood cancers. Protein supplementation in combination with resistance training may increase muscle mass and muscle strength in elderly subjects. The objective of this study was to assess the influence of post-exercise protein supplementation with collagen peptides v. placebo on muscle mass and muscle function following resistance training in elderly subjects with sarcopenia. Our data demonstrate that compared with placebo, collagen peptide supplementation in combination with resistance training further improved body composition by increasing FFM [fat-free mass], muscle strength and the loss in FM [fat mass]. Iron deficiency is common, especially among young women. Adding probiotics to foods could be one way to increase iron absorption. The aim of this study was to test the hypothesis that non-haem iron absorption from a fruit drink is improved by adding Lactobacillus plantarum 299v (Lp299v). In conclusion, intake of probiotics can increase iron absorption by approximately 50 % from a fruit drink having an already relatively high iron bioavailability. This study was conducted to evaluate the effects of zinc supplementation on glucose homeostasis parameters and lipid concentrations in PCOS women. We are aware of no study evaluating the effects of zinc supplementation on metabolic profiles of patients with polycystic ovary syndrome (PCOS). Taken together, 220 mg zinc sulfate supplementation per day for 8 weeks among PCOS women had beneficial effects on metabolic profiles. Studies suggest that a diet rich in omega-3 essential fatty acids may have beneficial anti-inflammatory effects for chronic conditions such as cystic fibrosis. …review found that regular omega-3 supplements may provide some benefits for people with cystic fibrosis with relatively few adverse effects, although evidence is insufficient to draw firm conclusions or recommend routine use of these supplements in people with cystic fibrosis. This review has highlighted the lack of data for many outcomes meaningful to people with or making treatment decisions about cystic fibrosis. Observational studies have suggested that various nutrients, dietary supplements, and vitamins may delay the onset of age-associated cognitive decline and dementia. We systematically reviewed recent randomized controlled trials investigating the effect of nutritional interventions on cognitive performance in older non-demented adults. Omega-3 fatty acids, B vitamins, and vitamin E supplementation did not affect cognition in non-demented middle-aged and older adults. Other nutritional interventions require further evaluation before their use can be advocated for the prevention of age-associated cognitive decline and dementia. In conclusion, supplementation with 162 mg/d quercetin from onion skin extract lowers ABP [ambulatory blood pressure] in patients with hypertension, suggesting a cardioprotective effect of quercetin. The mechanisms responsible for the BP-lowering effect remain unclear. Osteoporosis is an age-related disorder that affects both women and men, although estrogen deficiency induced by menopause accelerates bone loss in older women. As the demographic shifts to a more aged population, a growing number of men and women will be afflicted with osteoporosis. Since the current drug therapies available have multiple side effects, including increased risk of developing certain types of cancer or complications, a search for potential nonpharmacologic alternative therapies for osteoporosis is of prime interest. Soy isoflavones (SI) have demonstrated potential bone-specific effects in a number of studies. This article provides a systematic review of studies on osteoporotic bone loss in relation to SI intake from diet or supplements to comprehensively explain how SI affect the modulation of bone remodeling. In conclusion, the modern applications of SI are based on their estrogenic activities. SI have demonstrated their viable potential in decreasing bone resorption and enhancing formation. Studies using SI to preserve bone loss show more initial promise under in vitro and in vivo studies. However, further study is warranted to delineate the underlying mechanisms, efficacy, and safety of this compound, and especially, an investigation on the preventive effects of SI on typical human diet and potentials of dietary supplements is critically needed. … Therefore, more well-designed human clinical trials are called for evaluating the effects of SI on osteoporosis in functional, symptomatic, structural, and biochemical outcomes to build the translation bridge between these endpoints. Despite the global impact of these environmental changes, obesity appears to manifest preferentially in genetically predisposed individuals, and a high level of inter-individual variation has been observed among exposed populations6. Current evidence has shown that heritability estimates for obesity-related traits can be modulated by lifestyle factors such as physical activity (PA). You can see in this chart that, while a persons genes does affect their BMI (see: TT, CT & CC), their physical activity level (PA) still makes an impact (higher physical activity, lower BMI). Given the growing consensus that food intake may be the main driver of the obesity epidemic40, it is important to note that both PA measures displayed significant associations with both adiposity measures at baseline and at follow-up. This indicates that PA can influence obesity, despite the broad range of lifestyles among the participants. The value of PA for managing obesity has been recognized in a recent analysis of the National Health and Nutrition Examination Survey (NHANES) cohort from 1988–2010, which found that PA had a larger impact on BMI and waist circumference trends than calorie intake41. Our cross sectional analyses indicate that one hour of jogging or swimming (8.0 MET activities) per week was associated with approximately a 0.5 kg/m2 decrease in BMI. Together, these data challenge the idea of attributing the obesity epidemic mainly to excessive caloric intake40 and support the universal value of PA to maintain a healthy body weight41. These findings suggest that obesity prevention programs emphasizing vigorous PA for genetically at risk subgroups may be a valuable contribution to the global fight against obesity. On the basis of the current evidence, the traditional Mediterranean-type diet, including plant foods and emphasis on plant protein sources provides a well-tested healthy dietary pattern to reduce CVD. Inflammatory bowel disease (IBD), which includes Crohn’s disease (CD) and ulcerative colitis (UC), is a chronic inflammation of the small intestine and colon caused by a dysregulated immune response to host intestinal microbiota in genetically susceptible subjects. A number of fermented dairy products contain lactic acid bacteria (LAB) and bifidobacteria, some of which have been characterized as probiotics that can modify the gut microbiota and may be beneficial for the treatment and the prevention of IBD. The use of probiotics and/or synbiotics has positive effects in the treatment and maintenance of UC, whereas in CD clear effectiveness has only been shown for synbiotics. Furthermore, in other associated IBD pathologies, such as pouchitis and cholangitis, LAB and bifidobacteria probiotics can provide a benefit through the improvement of clinical symptoms. However, more studies are needed to understand their mechanisms of action and in this way to understand the effect of probiotics prior to their use as coadjuvants in the therapy and prevention of IBD conditions. Eating frequently during the day, or “grazing,” has been proposed to assist with managing food intake and weight. One key area in obesity treatment is reducing energy intake (4). Ideally, the dietary prescription provided for reducing energy intake aids with appetite control, thereby enhancing ability to consume less energy, producing greater weight loss, and improving long-term weight loss maintenance. One dietary strategy that has long been proposed in the lay literature to improve appetite control and assist with weight management is increased eating frequency (EF) (i.e., eat small amounts of food every 2–3 h –“grazing”) (8, 9). However, while “grazing” is often suggested as a helpful strategy for managing hunger, the Dietary Guidelines Committee of 2010 stated that there is a lack of research in the area on EF and body weight and obesity, thus conclusions regarding an optimum EF prescription for weight management cannot be made and research on this topic is greatly needed (10). Therefore, within the scientific community there is agreement that the relationship between EF and management of food intake and weight is not clear (10). The purpose of this systematic review was to provide a comprehensive review of experimental research conducted in both humans and animals in the areas of greater EF, food intake, and body weight. Twenty-five studies, using varying study designs, EF manipulations, and lengths of experimentation, were identified and included in the review (20–44). As a whole, the reviewed experimental studies provide little support that increasing EF influences intake or body weight. The hypothesis that increased EF may influence energy intake and/or anthropometrics continues to be sustained in the literature. The outcomes of this review show that more than half of studies found no significant difference in energy intake or anthropometrics in differing EF conditions. In summary, the human and animal experimental studies included in this review suggest that greater EF may not necessarily influence energy intake or anthropometrics. This indicates that contrary to what is commonly proposed in the lay literature, eating more frequently during the day (i.e., “grazing”) may not assist with reducing energy intake or improving weight status. The present study demonstrates that regular consumption of pistachio nuts not only improves glycemic and lipid parameters, but also results in improvements in vascular stiffness and endothelial function. Importantly, these improvements were seen in apparently healthy individuals and with a diet (including pistachios) and exercise regimen that every adult individual is expected to follow. Our data indicate that consumption of date fruit may reduce colon cancer risk without inducing changes in the microbiota. Cocoa flavanol (CF) intake improves endothelial function in patients with cardiovascular risk factors and disease. The observed cardiovascular benefits include the recovery of endothelial function, a decrease in blood pressure (BP) and improvements in lipids and insulin resistance. A high-flavanol cocoa extract (Cocoapro®-processed cocoa extract; Mars Inc.) was the source of flavanols in the CF-containing drink. Cocoa flavanol intake decreases blood pressure, vascular stiffness and cholesterol. Our findings support the notion that CF intake has the potential to support the maintenance of cardiovascular health. Furthermore, our data add to the accumulating body of evidence regarding the health benefits of dietary flavanols and procyanidins in general, thus contributing to evidence-based assessments of potential future dietary guidelines for these bioactives. Metabolic syndrome (MetS)6 is characterized by a clustering of cardiovascular disease (CVD) risk factors, and as the number and severity of these increase, so does the risk of CVD, type II diabetes, and all-cause mortality (1, 2). Treatment of MetS includes weight loss to reduce abdominal obesity, a healthy dietary pattern, and regular physical activity (3). This study compared 3 diets varying in type (animal compared with plant) and amount of protein on MetS [metabolic syndrome] criteria. Weight loss was the primary modifier of MetS resolution in our study population regardless of protein source or amount. Our findings demonstrate that heart-healthy weight-loss dietary patterns that emphasize either animal or plant protein improve MetS criteria similarly. Both diets achieved substantial weight loss and reduced HbA1c and fasting glucose. The LC diet, which was high in unsaturated fat and low in saturated fat, achieved greater improvements in the lipid profile, blood glucose stability, and reductions in diabetes medication requirements, suggesting an effective strategy for the optimization of T2D management. In childhood IBS, a low FODMAP diet decreases abdominal pain frequency. Gut microbiome biomarkers may be associated with low FODMAP diet efficacy. It’s often said that the bacteria and other microbes in our body outnumber our own cells by about ten to one. That’s a myth that should be forgotten, say researchers in Israel and Canada. The ratio between resident microbes and human cells is more likely to be one-to-one, they calculate. If you are ready to use your content to grow your business, this is for you! There are lots of bonuses, plus a fast-acting AMAZING bonus (HINT: I will write for your blog). If you want me to personally help you develop your content strategy and plan 3 months of your editorial calendar (including six “done for you” health articles for your blog as well), now’s your chance to dive in! I’ve been hosting a monthly vote for which “done for you” pre-written blog post you’d like me to feature. These posts are already researched, written and edited (you can read the introductions and click on each of the references to check them out). Each one has taken me 12 -16 hours to create, so I’m saving you TIME (and letting you borrow my “science brain”)! All you need to do is buy it, download it to your computer, and upload it to your blog as your own content. And waaay less time than creating a post from scratch! You can even add your own image, personalize it a bit, and BOOM a brand-spanking new blog post in almost no time for just CAD$17. Some people love that the articles are so long and detailed that they break them up into two weeks worth of content on their site. Click here to see all of the “done for you” health articles you can choose from. 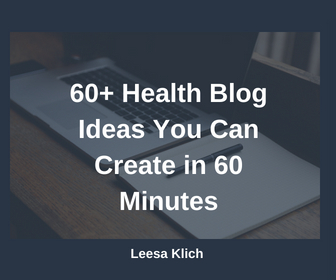 I’m Leesa Klich, MSc., R.H.N., a content and credibility specialist on a mission to help wellness practitioners get the right information to pass on to their clients and audience to build their businesses and improve public health on an epic scale. When it comes to health, my passion is focusing on what’s right, not who’s right. I help wellness practitioners build credibility by understanding and creating quality content based on the best scientific research. I also compile health research, create customized and “done for you” blog posts, and help strategize blog content. To work with Leesa, click here.